What do you pray when you find yourself facing a huge need or you’re overwhelmed by circumstances? What do you pray most for your children? If I’m honest, I often pray the fix-this-situation prayers. “Help me through this, Lord” or “Meet this need, Father.” That can also be the heart of my prayer for friends going through serious issues or for my children up against a big decision or need. Paul’s prayer was completely different. He was writing to fellow believers in the church he’d planted in Philippi. He loved the Philippians – people like Lydia, a businesswoman whose whole household came to know Christ and who opened her home to Paul. People like the young slave girl, freed from the demons that had plagued her, and the gentile jailer, who saw first-hand a God-sent earthquake that set loose prison chains and prison doors after an in-house praise service. 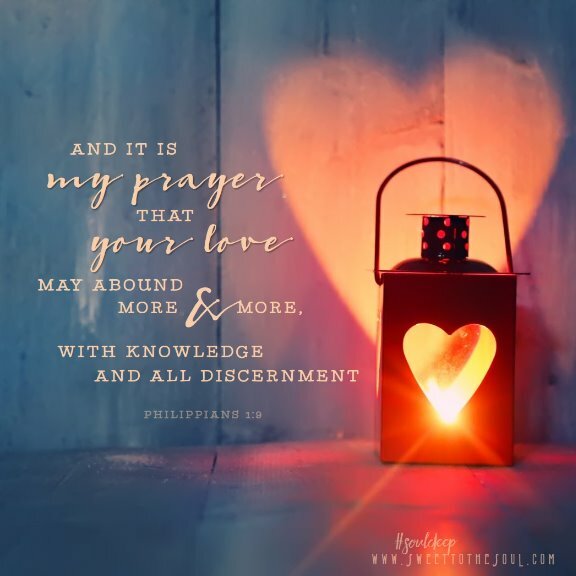 His beloved Philippians were going through serious persecution and Paul himself languished in prison, unsure whether he’d be executed or released. That they would be safe. That their needs would be met. That their persecution would end. That their church would double in size. That they could break ground on a new building. But instead, Paul prayed for their love. For their love? They’d already demonstrated some pretty selfless love. And yet, Paul prayed that their love would abound. It’s a picture of love that is continually overflowing, like the cascading water of a tiered fountain that flows and flows and flows without end. This isn’t the kind of emotional feeling that can be generated by trying harder or stirred up with good praise music. This isn’t something we feel on Sunday but it dissipates by Friday. That kind of emotion will wear thin when we are face to face with the hard of life. Paul understood perfectly that the secret of a flourishing Christian wasn’t in having every need met but in an anchor-deep love for God. That was his prayer for the hard places. As we know God more, we love Him more. How I loved God as a 15-year-old, when I begged Him to change me and could feel His peace wash over me. But that was nothing compared to how much I loved God as young mom, diving into my first Bible studies and daily clinging to Him for wisdom, patience and forgiveness in raising kids. And all of that pales in comparison to how, as a new widow, I love God all over again. His Word has been my delight, He has daily lifted my head and He has so tenderly and personally taken care of us. In our whole lifetime, we cannot begin to plumb the depth of our love relationship with God. When we find ourselves struggling in the hard or facing a huge need, we can ask God to meet the need. But even more, we have another prayer for the hard places. We can pray right in the midst of the hard, that our love will abound. ​Lisa Appelo is a single mom to 7 and unexpected widow, writing about the faithfulness of God and all of the crazy good lessons He teaches at TrueandFaithful.net. You can also connect with her at Facebook . Loved this Lisa! "As we know God more we will love him more" such a beautiful truth and picture of a growing relationship with Hod. Thank you, Jana! You have a great community here and I'm honored to share. The truth that I should be praying to LOVE right in the middle of the hard, hit me squarely. I was in need of this scripture and your words today. I'm reflecting in the fact that I'm Christ's follower and many times I lack to love people in the same way that Jesus loves them. Is difficult works for a small community where gossiped is their daily bread. Nevertheless, I go to work daily hopping the best from people and with the compromise to do my best to the little people I serve. Thanks for help me grow spiritually. Thank you for let me be part of your community! Shalom, Lisa!!! Wow, Lisa. I am so glad I stopped by and read this today. I've prayed those fix it prayers so often, but God always has a better plan than anything I could think or imagine. Thank you for digging deep into his Word here. What a gift. Lisa. Beautiful. How often I need to pray to be anchored in God's love and faith and hope instead of praying for fixes.